Pope John Paul II in a file photo. Pope John Paul II, famous for his power to communicate the Roman Catholic Church’s message around the world, is getting another chance to do so, with the Vatican launching pages dedicated to him on Facebook and YouTube. The Holy See launched the social networking pages Tuesday, in advance of the beatification of Pope John Paul II on May 1, the last step before sainthood. "The aim is to diversify the instruments so as to give this initiative as great an exposure and as wide a coverage as possible,” the Vatican press office said in a statement. The new Facebook and YouTube pages feature video clips from John Paul’s nearly 27-year pontificate and are being maintained by Vatican Radio and of the Vatican Television Centre. 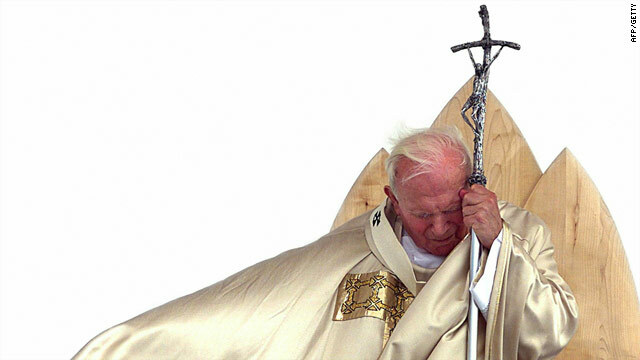 The Vatican announced in January that John Paul II, who died in 2005, would be beatified later this year. The social networking campaign around his beatification comes after Pope Benedict praised online social media, even while identifying some dangers of the new technology. “In the digital world, transmitting information increasingly means making it known within a social network where knowledge is shared in the context of personal exchanges,” Benedict said in a January statement for the church’s World Communications Day. “This dynamic has contributed to a new appreciation of communication itself, which is seen first of all as dialogue, exchange, solidarity and the creation of positive relations,” he said. In order for a candidate to be beatified, one miracle after death must be proved through the scrutiny of medical and theological experts. En el año 2005 el 30 de diciembre, mi hija Camila con apenas 3 meses de vida sufre una obstrucción en la garganta con una placa de ortodoncia, pues nació con fisura en el paladar. Estuvo soportando 4 horas aproximadamente ese ahogo...en mi mesa de luz estaba la estampita del papa, me la había dado mi mamá el día anterior, fue lo único que agarré y empece a rezarle, cuando llegué a el hospital porque hubo que trasladarla la doctora me preguntó si le pedía a alguien...porque era un milagro que una bebé resistiera 4 horas ahogada. Hasta el día de hoy le agradezco, y si con cami hizo un milagro, no se entiende por donde le entraba el oxigeno. 2) Rules the world for 1260 years (from 538 A.D. – 1798 A.D.). By now most of the people have guessed that it's the Papacy. They're correct. It's the only power on the face of the earth that fits all of the Bible characteristics for it. out of curiosity where is the 666 in the papacy come from? I tend to think of it as a mere coincidence, though, Joe! Your faith has healed you, go in peace...He who has no sin, let him cast the first stone...Who among these men, the rabbi, the levite or the samaritan, proved to be a neighbor to this man...You do not receive because you do not ask, and you ask for the wrong motives. Ask and it shall be given you, for if you ask humbly and for the right motives, my father in heaven, who provides all things, cannot refuse you...I tell you, this poor widow has given more than all the other rich people, for while they gave out of their abundance, she gave out of her poverty...You can see the speck in your friend's eye, but you don't notice the log in your own eye...etc...Words spoken more than two thousand years ago. Words that ignite a fire in your heart, softens it. Words that will outlast time itself, for they are the eternal truth. Write these words into your heart, for they are treasures from heaven. Etch them deeply into your being by practicing them with all your heart. And when they are etched deep, nothing can take them away from you. Did you read the passage. Read it CAREFULLY. The passage says the man passes through the fire, not the works. Read carefully. Do you believe in sanctification? Apparently not if you think there isn't a purification needed. That it all was purified 2000 years ago at the cross. You must also be a universalist, i.e. everybody goes to heaven, unless you a calvinsit who doesn't believe Jesus died for everyone. Jesus earned the grace for all to be saved 2000 years ago. It has to be applied to our lives TODAY. Gerald. I am a saved, Baptised by immersion, filled with the Holy Spirit follower of Jesus Christ. So you know who I am . Please go read..all say "a man's WORKS shall pass thru fire. The verses below......there you willl find cleansing, santification, purging. Jesus Christ done it all. Period. No difference does the Lord make between his children, as long as they are washed in his blood and filled with his Holy Spirit. Here, Gerald, is a key verse. ..."unto all and all that believe them, for there is no difference."